Our enrichment program for our chimps goes on. 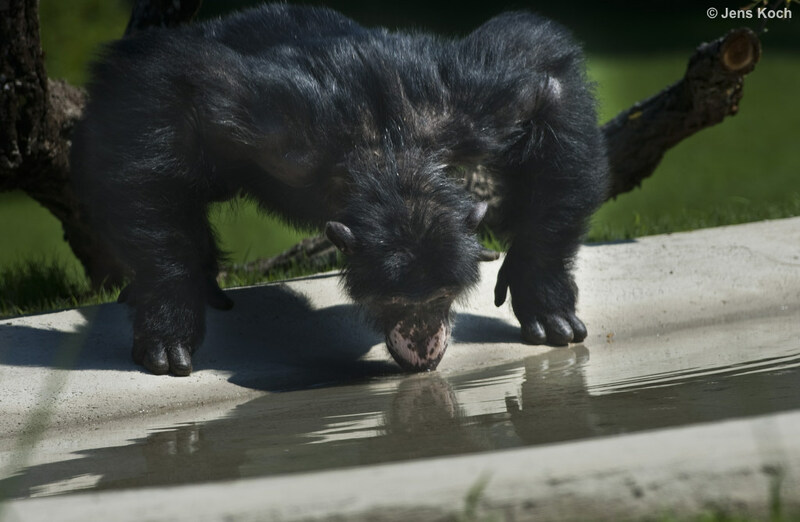 This summer our chimps have to learn how to “fish” something out of wholes. So we put a tuffaceous rock in the garden in which our chimp’s attender Renate Foidl hid rosins, grapes and other delicacies. We gave them sticks and now aged over 30, they have to find a way how to get the delicacies out of the numerous hole - a skill they would have normally gained from their mothers in a very young age. Our Chimps have to be permanently trained in order not to fall back in old behavior patterns their got used to in captivity. So we have developed an ever ongoing enrichment program. 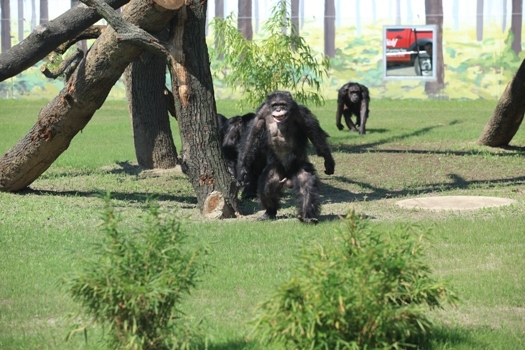 Now that the weather is almost unbearably hot our chimps –unlike our other animals- spent their time outdoors. Too many years have they been in captivity not being able to enjoy summer. Our animal care taker had a wonderful idea in order to adjust the enrichment program to the hot weather conditions: She put appetizing fruits in ice cubes, put them in the garden and then opens the doors…. Now the chimps had to act! Moritz decided to go the brutal way: he tried to smash the ice cube. In vain! David and Kathi were more clever. They through the tempting ice cubes into the warm water of a pond so they could melt. Bonnie was more patient. She scraped with her teeth the ice around the fruits. Our chimps experience for he first time snow ! During the 1970s and 1980s, animal research laboratories relied heavily on chimpanzees. After the AIDS epidemic, there was an upsurge in demand for chimps. Monkey catchers swarmed around the African rainforest to trap baby chimps for Research. 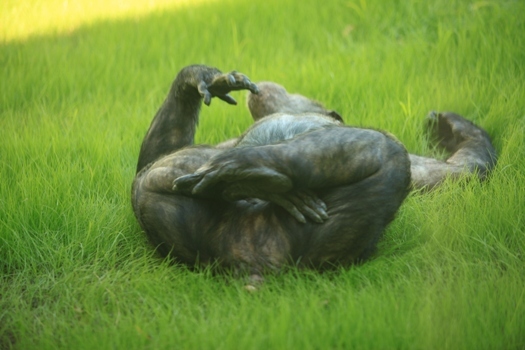 Adult chimps are difficult to catch: they are highly intelligent, and also seven times stronger than humans. The catchers wasted no time. They used brutal methods to trap the young chimps. 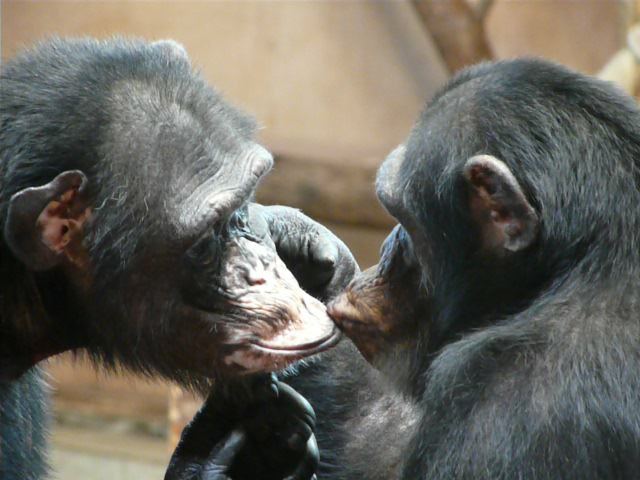 The mother–child relationship is as intense for chimps as for humans. Infants cling to their mother’s belly for three years, and ride piggyback for four more years. Shooting their mothers was the only way to catch the infants. 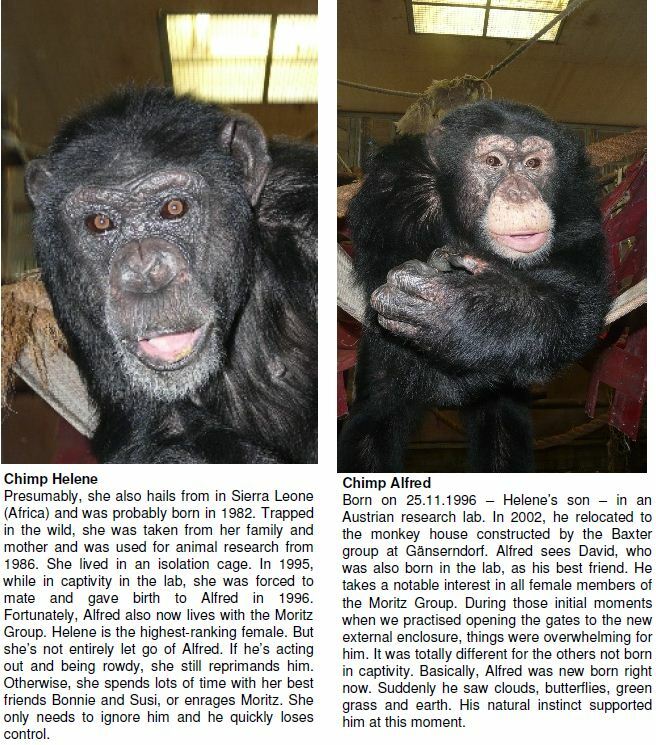 Most of our Chimpanzees came from Sierra Leone and were intended for the IMMUNO lab in Orth - then, located in Vienna. After 1997, due to a company takeover, they were released from animal experimentation. Their new owners (Baxter) conduct no experiments with primates. In 2002 the chimps were transferred to a safari park. 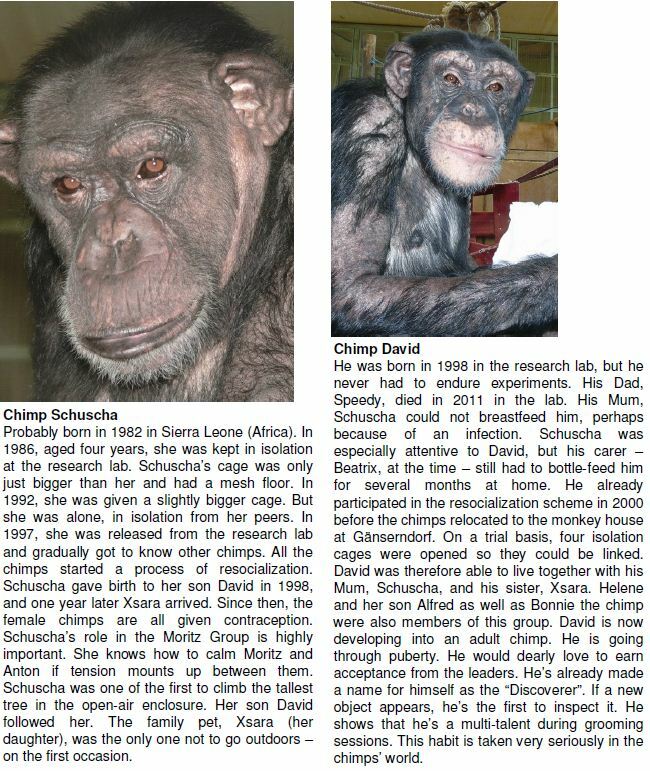 After the Safari Park went bankrupt in 2004, the chimpanzees became in 2009 ‘Aiderbichler’! The construction of their future home began. On a 2,500 m2 big territory two houses, ‘House A’ and ‘House B’ were under construction. House A consists of seven enclosures and should become home for the less ill-treated animals. 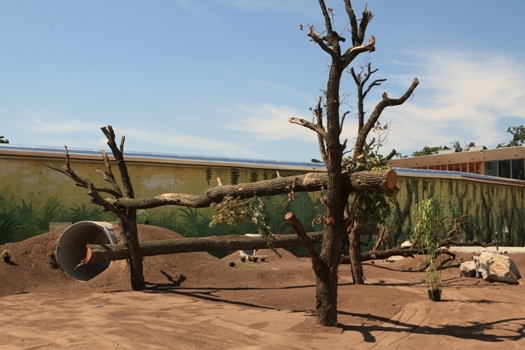 House B consists of four enclosures and will be home for the most traumatized Chimps. 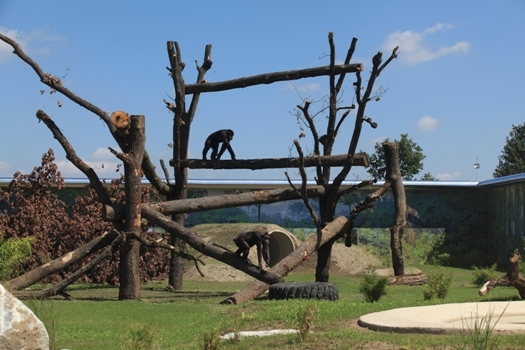 In September 2011, the gates to the great outdoors opened for the 26 ex-lab chimpanzees from ‘A-House’. In just a few months, the other 11 chimpanzees also went outside along with 5 primates and Juppi, our cute kinkajou (‘honey bear’). 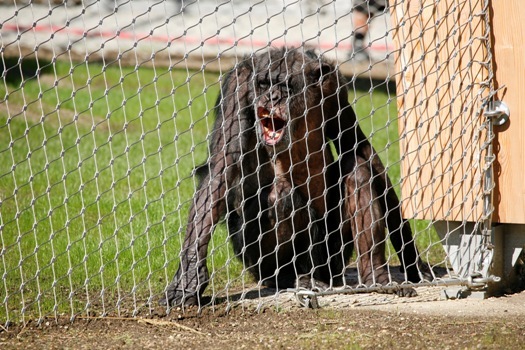 We came up with something really special for these chimpanzees: Enclosures offering as much freedom as security. We constructed 10-metre high arches that are covered with a steel safety net. We also created climbing apparatus, water features and many more luxuries. The 11 chimpanzees from ‘B-House’ experienced more intense research experiments than most of the others. That included no contact with humans or their own kind – for decades. 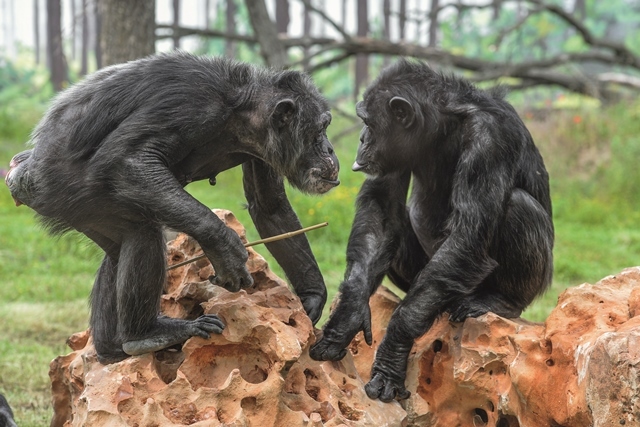 To thank the chimpanzees for their huge sacrifice, the Baxter pharmaceutical group continues to contribute major donations for them – until today. 2.500 qm of incredible happiness: Our outdoor enclosure. We came up something really special for these chimpanzees: Enclosures offering as much freedom as security. We constructed 10-metre high arches that are covered with a steel safety net. We also created climbing apparatus, water features and much more. 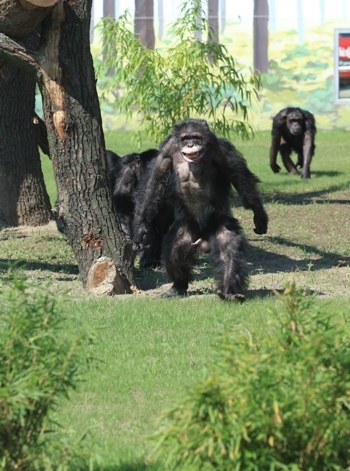 The 11 chimpanzees from ‘B-House’ experienced more intense research experiments than most of the others. That included no contact with humans or their own kind – for decades. Animal caretakers and researchers approached them wearing protective suits that were similar to spacesuits. After 1997, due to a company takeover, they were released from animal experimentation. Their new owners (Baxter) conduct no experiments with primates. To thank the chimpanzees for their huge sacrifice, the pharmaceutical group continues to contribute major donations for them – until today. 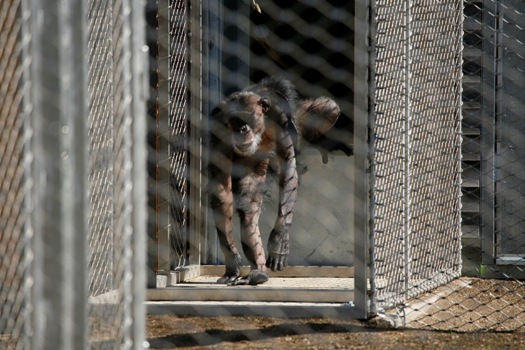 Don’t delay your ‘Plus’ animal sponsorship and confirm your visit early to see the chimpanzees at the “Gut Aiderbichl Sanctuary for Traumatized Chimpanzees and other Primates” in Gänserndorf near Vienna. He must have noticed a little from the opening of the slipcase at Gut Aiderbichl sanctuary for traumatized chimpanzees and other Primates. The joy and emotion in his group. He lived from 1986-1999 in the laboratory. He was born in 1983 in freedom in Africa. Jakob has long been suffering from an incurable, degenerative brain disease. The others in his group Holophernes, Maxi, Gogo, Blacky, John and Isidore noticed, that he changed. Therefore, they treated him more considerate, and went to him. 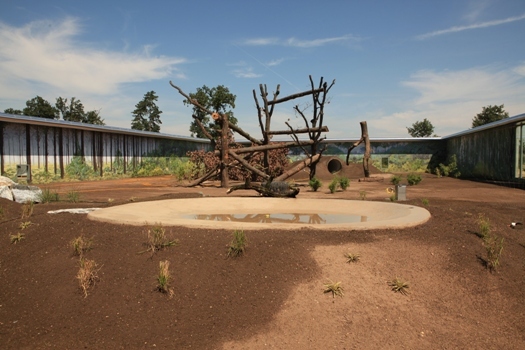 Jacob was able to observe through the large glass tanks building up the outdoor enclosure. An exciting change to the monotony of many years of an experimental laboratory. He was there when the first slipcase was opened. However, since he was feeling so that we can not be 100% absolutely sure that this moment as he witnessed the others inside. Holophernes, who knew him from better times, tried him to convey the euphoria of the group by loving contact. The last time we had to separate him and put in a separate room. Noticeably worsened his condition. He put fruit in his mouth and forgot to chew it. The doctors, we asked for help, recommended to let him go peacefully. Jacob did not have much of his life. He was just three years old when he was captured by the monkey-catchers. Most of his family back in 1986 died in the hail of henchmen, including his mother. Equipped with these last pictures of the freedom, he was sent to a laboratory. Since 2002 he lived in the men's group. Since that time it was the animal keepers Renate and Annemarie who became obvious that he was leaving his trauma and faded more and more the horrific images of that time. He was particularly curious, and showed in dealing with other special features. As consideration for others and responsibility. He could not have been better. Holophernes (r.) responded cautiously to the illness of Jakob. We thank all the people who support our chimpanzees, so that we were able to help. 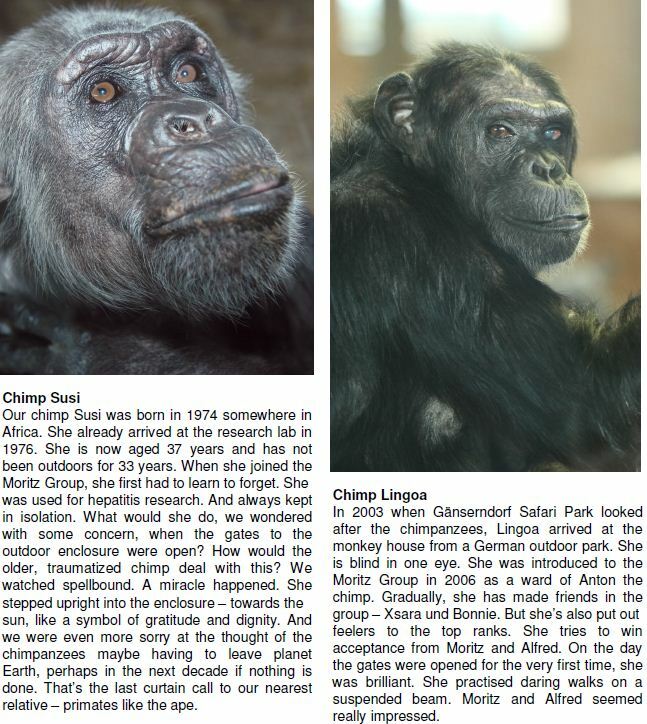 That we could be companions for a very special kind of chimpanzee. For Peter, the gate to his outdoor enclosure was opened for the first time. Before he can set foot on the grass meadow, Peter first has to go through a tunnel with asphalt flooring. Standing in the tunnel with his fur bristling, he tentatively moves towards the grass. At first, he doesn’t climb over it on foot, but gently feels the dense grass blades on the ground with his hands. Then, sniffing his fingertips he carefully edges onto the meadow. He inspects every inch of the mesh-covering of his new life of freedom from now on. But his gaze is also constantly fixed on his carer. Soon afterwards, he already climbs onto the wooden frame, watching his surroundings and constantly shifting his gaze – we wonder what’s going on in his head? After two hours, Peter goes back to his living quarters and observes closely as his outdoor gate is shut. Day 2, outdoor enclosure for Peter: a gentle breeze blows through Peter’s fur. Excitedly, he marches along the periphery of the outdoor enclosure. Suddenly, some raindrops land on Peter – he shakes himself in agitation and hurriedly returns to his living quarters. 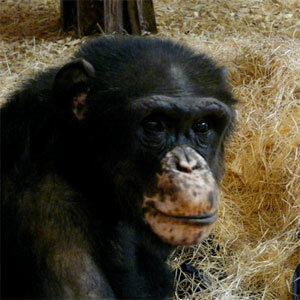 Peter was aged 3 years when he was used for experiments. He currently lives alone, since he has trouble getting on with his peers. Today, Peter is going outdoors for the third time. Several months previously, every day he watched attentively from the windowsill of his living quarters as construction work progressed for his outdoor enclosure. You had the feeling that he was getting this work done just for him! The site workers repeatedly cast envious looks towards Peter whenever he sat on his window seat, enjoying light snacks or simply resting his legs against the window frame. He soaked up the hot rays of sunshine through the glass window, occasionally using his lower arm as a sunscreen and resting his hand on his forehead. The workers gave him the name ‘site foreman’, as he generally only left his viewing point for food, or when his quarters were being cleaned. Today, he is more self-confident and accepts the completion of his outdoor enclosure. He frequently climbs on the climbing frame, already calling sometimes whenever he hears the other chimpanzees. He also occasionally shows off by jumping up at the cleaning area. He only encircles the water point – he doesn’t really find out that this gradually fills up with water. It’s time for the evening meal: Peter moves towards the direction of the indoor quarters making noises for food – his carer calls him. Peter is looking forward to his food. A unique meeting of our animal sponsors! Politicians, celebrities and Gut Aiderbichl Sponsors celebrated the official opening of the outdoor enclosures for our ex-lab chimpanzees at Gut Aiderbichl’s Sanctuary for Traumatized Chimpanzees and other Primates in Gänserndorf near Vienna. Impressions of a truly memorable day. 400 invited guests and all those attending witnessed the chimpanzees celebrate their second birthday! Most people only realized that this was one of the most important events of all, when they saw how the chimpanzees were able to go outside again after decades kept in isolation. Guests in attendance today were privileged to see this for themselves! 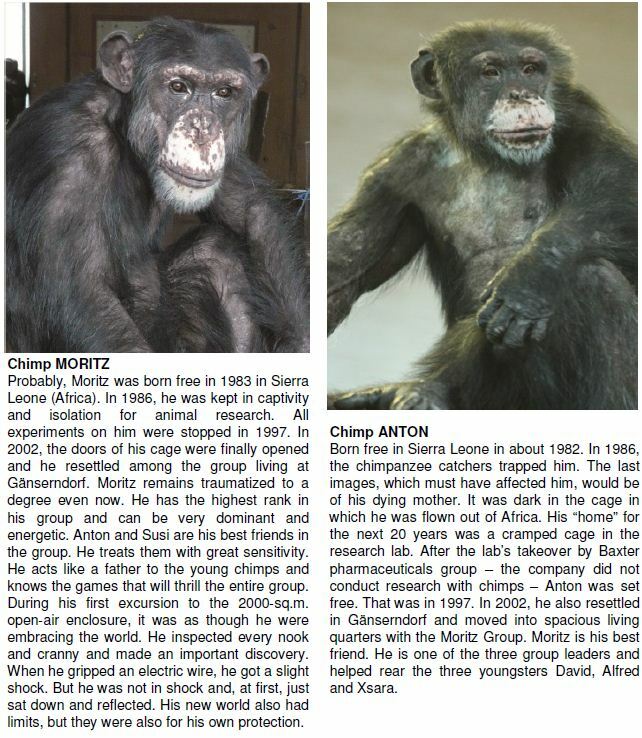 Chimp Moritz and Chimp Martha enjoy the first few minutes in their new outdoor enclosures. The Best “Practice Tour” in the World! 2,500m² is a vast space for humans. But for the chimps at Gut Aiderbichl’s Sanctuary for Traumatized Chimpanzees and other Primates, this means a whole universe and freedom at last after decades in the research lab and monkey house. What we saw during the practice tours and what the chimp carers told us is heart-warming and thrilling. With two enclosures – one indoors and one outdoors – Moritz has a tough job sticking to the old rules and routines as Boss of the Group of 10. Xsara stayed indoors. And Susi, who is usually introverted and inflexible, becomes the star of the outdoor enclosure! Gut Aiderbichl Animal Sponsorships can be extended. You can purchase the ‘Plus Card’ – from 5 euros monthly, and your donation can support Gut Aiderbichl’s Sanctuary for Traumatized Chimpanzees and other Primates. 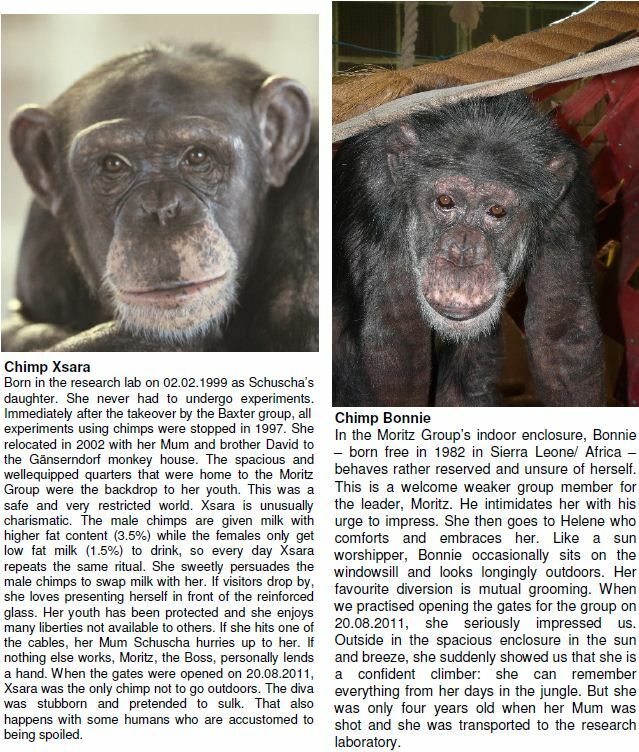 Patrons, donors and ‘Plus’ Sponsors can visit the chimpanzees – in small groups – and at specific published times.